“Verkiezingen? Waarvoor dan?” vraagt taxi-chauffeur Dusan terwijl hij door de straten van Zagreb rijdt “Oh, de EU. Daar heb ik niks mee”. De Kroaten gaan zondag voor het eerst naar de stembus voor het Europees Parlement. Tien jaar lang leefde Kroatië toe naar dit moment, maar nog voor de officiële EU-toetreding op 1 juli is het enthousiasme over de Unie aan het afnemen. En voor verkiezingen Europese Parlementsverkiezingen wordt een extreem lage opkomst verwacht. De aanhoudende eurocrisis maakt steeds meer Kroaten sceptisch over de Europese Unie, zegt Srdjan Dumicic van Ipsos, de grootste opiniepeiler in Kroatië. “Alsof we binnenkomen op een feestje dat over het hoogtepunt heen is. Iedereen is al aan het opruimen.” Vorig jaar zeiden de Kroaten middels een referendum officieel ja tegen de toetreding. De opkomst was slechts 44 procent, de grondwet moest worden aangepast om de uitslag geldig te laten verklaren. Ruim tweederde stemde voor toetreding. Een meerderheid, maar aanzienlijk minder dan toen de onderhandelingen met Brussel in 2003 begonnen. “De EU is een ramp geworden”, zegt Sinisja, ober in een restaurant in Zagreb. Hij stemde tegen bij het referendum. “Kijk naar Cyprus. Dat kan ons ook gebeuren. We hebben de EU niet nodig”. Kroaten kijken vooral ook naar buurland Slovenië, dat al in 2004 lid werd. “Vraag de Slovenen of zij een beter leven hebben gekregen. Hun antwoord is nee. We maken een grote fout”. Ruim dertig procent van de Kroaten is tegen toetreding tot de Unie, volgens Bosnjak groeit dat aantal alleen maar. “Wacht maar tot de Duitsers en Italianen straks onze prachtige eilanden komen opkopen”. In het pand van de EU-delegatie in Zagreb is een verkiezingsdebat gaande, de opkomst is dramatisch laag. Er wordt nauwelijks campagne gevoerd. Valentina Otmacic, onderzoeker aan de universiteit, is een van de weinige aanwezigen. “Burgers zijn niet geïnformeerd, de meeste kandidaten zijn onervaren en ze hebben een zwak Europees verhaal. Het leeft gewoon niet”, legt ze uit. “Nu de toetreding een feit is kan het burgers én politici weinig meer schelen wat er daarna gebeurt”. Economisch gaat het niet best met Kroatië, er is een torenhoge staatsschuld en enorme werkeloosheid. “Burgers zijn realistisch”, verklaart Dumicic. “Ze denken: veel slechter dan nu kan het toch niet worden”. Goranov became the face of the country’s protests that began more than a month ago. Protesters created a memorial for their new “Bulgarian hero” in a small park opposite of the parliament building in the capital Sofia. 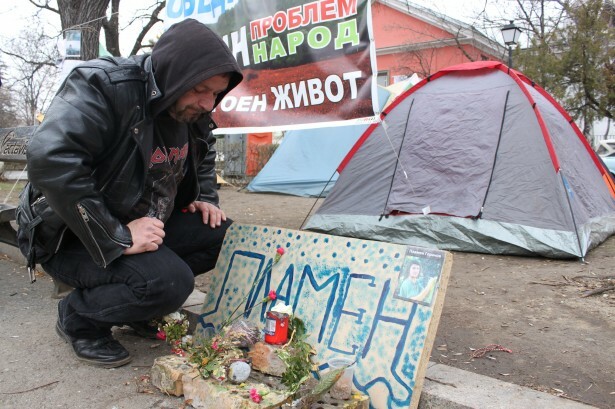 They wrote “Plamen” in Cyrillic on a piece of carton, with fresh flowers, candles and a picture of him. The protests started with anger over high electricity bills. Tens of thousands hit the streets in mid-February, burning their bills in front of government buildings in all of the country’s major cities. This action symbolized the overall low standard of living in the poorest country in the European Union, where the average salary of €400 ($514) per month is not enough for many people to live on. In the winter months electricity and heating costs skyrocketed; some Bulgarians received bills larger than their monthly income. The protests resulted in the resignation of the center-right government of Prime Minister Boyko Borisov, but the people are not yet satisfied. Nobody answered their demands for a better life, higher salaries, and an end to corruption and monopolies. Some call it a revolution, an erupting “Bulgarian Spring.” Others speak about it as yet another attempt to rid themselves of their communist past. The aftermath of the break-up of the Soviet Union in Bulgaria wasn’t as successful as in countries like Poland and the Czech Republic. When the first democratic elections were held in 1990 and won by former communists, democratic reforms didn’t follow. The second attempt to change the system came in 1997, when hyperinflation hit the country. Large protests resulted in the resignation of the former communist regime and opened the doors to membership to the European Union and NATO. But again little changed in the core of the system, which according to many people is saturated with corruption. 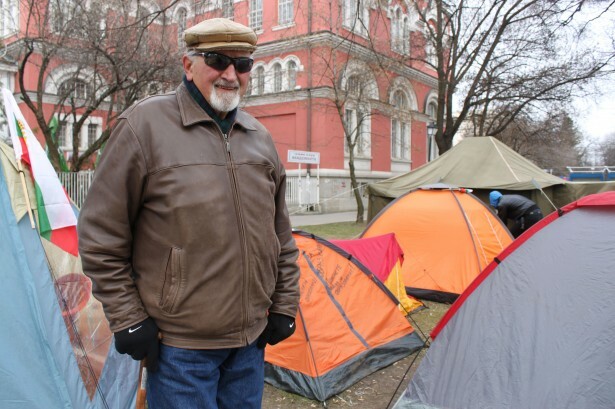 In front of the parliament building, inspired by the Occupy movement, a tent encampment appeared. A woman who goes by Vera is one of the activists who has been living in the camp permanently since the protests started. “We will stay as long as necessary,” she said. An older man passes by and expresses his support. “They are the new generation; it’s their turn to make changes in this country.” He introduced himself as Mladen Mladenov. Now 80 years old, he was one of the people who took to the streets when the Soviet system was collapsing, and it hurts him to see that nothing really changed. “The same people are in power. They gave us a bit more freedom, but now we’re not able to survive.” Mladenov receives a pension of 150 lev ($96) per month. Since it’s barely enough to pay his bills — let alone pay for medication — his daughters who live in the United States send him extra money. Many protest banners say “Stop the Mafia.” According to the Center for Democratic Studies in Sofia, the level of corruption in Bulgaria is three times higher than the EU average. Its report cites 150,000 bribes every month in all sectors of society, from the judiciary and police to customs and government licenses. “Formally we are a democracy,” Minchev said. “But we have an economic system completely controlled by oligarchs.” The privatization that happened under pressure of the EU was in many cases illegal, he pointed out. “It’s like oil and water. A democracy doesn’t mix well with an oligarchic monopoly economy. It simply doesn’t work.” A key example of this problem is the monopoly on the energy market, which is the main reason for the high prices for electricity and heating. “Over the past four years half a million people lost their jobs,” explained Georgi Angelov, an economist at the Open Society Institute in Sofia. Unemployment and a lack of economic opportunities have led to a massive exodus from Bulgaria. The population declined by 2 million over the last 20 years. An estimated half a million Bulgarians live and work abroad, mainly in Western Europe. With the lifting of labor restrictions for Romanians and Bulgarians on January 1, 2014, an even bigger exodus is expected. “For many people it’s the only way out,” said Angelov. Some blame the EU for the rising poverty in the country, others blame it on oligarchs and politicians. Some want to nationalize all the privatized companies, others ask for more liberalization. As the demonstrations continue, these various factions are failing to cooperate with each other. There is great diversity and several protest leaders are speaking to the public separately. Recently three prominent Bulgarian protest leaders established a group called Movement for Civic Control. The student group EaglesBridge, which is named after a famous bridge in Sofia, is also active. The problem, Ognyan Minchev said, is the lack of leadership. “There’s a lack of experience and still no charismatic leader stood up.” With early elections scheduled for May 12, protesters have no one to address their demands to, so they stay home. After the previous government resigned, a caretaker government that was not able to change laws and was only responsible for organizing the parliamentary elections took its place. Nevertheless, every Sunday a couple hundred people still take to the streets in all the major cities to raise their voices.